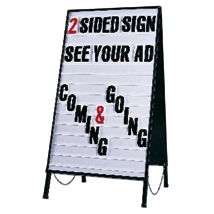 Double Sided Changeable Letter Sign Gets Your Message Noticed! Great outdoors or indoors! The double sided letter a frame is perfect for the entrance or a sidewalk sign. Double sided for extra impact. Easily folds for portability. Includes 330 4 in. letters, numbers and symbols. Changable message area size: 21 in. w x 36 in. H.